One of the great joys of being an elected official is the unsolicited email you get from people. The Internet (thank you Al Gore) gives everyone a platform to say whatever they want and broadcast it the world over, for free. My favorite from the last few years was one that was seriously worried about black UN helicopters coming over the border from Canada. Fortunately I didn’t have to answer it – he wasn’t in my district. 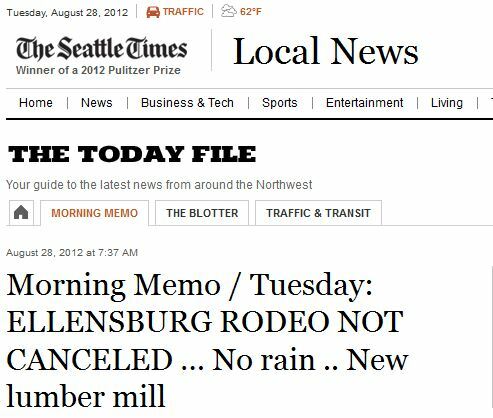 Today all legislators and a host of media outlets got a message that looked official enough to fool the Seattle Times into briefly publishing it on their website – that the Ellensburg Rodeo had been cancelled due to the Taylor Bridge fire. (It has not.) I might have believed it if I had not gotten a similar email every year from (presumably) the same guy for much of the last decade. For some reason he doesn’t like the rodeo, which I hear is great fun. Here’s the text of the message. It is NOT TRUE, but it IS funny. The guy puts a lot of work into it, including setting up a spoof website with nice pictures of flames and the same message. The Kittitas County Sheriff Gene Dana sent out the following press release news memo for immediate release. We, at the Ellensburg Daily Record, made absolutely sure to verify the matter with Kittitas County Sherriff Gene Dana himself – and also with Kittitas County Undersheriff Clay Myers – and even confirmed it with Sheriff Dana by direct telephone contact. Below is Sherriff Gene Dana’s press release. “We regret to inform you that the BOTH the annual Labor Day Ellensburg Rodeo and coinciding Kittitas County Fair has been CANCELED in its entirety, and includes the Ellensburg Rodeo Parade on Saturday. The rodeo had been scheduled for Friday, Aug. 31, 2012 – Monday, Sept. 3, 2012; the fair had been scheduled for Thursday, Aug. 30, 2012 – Monday, Sept. 3, 2012. “The cancellation is due to the recent Taylor Bridge Fire which has still not been totally contained. The fire, which has been burning since Aug. 13, covers 36 square miles of land. About 27,000 acres between Cle Elum and Ellensburg has burned in the fire. More than 1,000 people are working to stop the blaze. The emergency shelter area at the fairgrounds is holding many horses, pigs, donkeys, mules, alpacas and even ostriches, with many more on their way to the county’s designated disaster holding area for larger animals. Kittitas County lodging is totally booked up due to the many fire evacuees who lost their homes. There is much stress and chaos currently at the Kittitas County Fairgrounds. “Once again, to be sure: BOTH the 2012 Ellensburg Rodeo and the accompanying Kittitas County Fair had been CANCELED. Furthermore, unfortunately, the fire is largely NOT contained and most state highways and interstates to Ellensburg are NOT expected to be opened and, if somehow coming into Kittitas County or Ellensburg, expect to experience extensive frustrating delays due to the Taylor Bridge Fire. Tyler Miller is the Publisher of the Ellensburg Daily Record newspaper.